Have you been to New Chinatown? That’s what I’m calling Jasper Avenue and 109 Street. Within a block of this intersection nearly a dozen shops now serve Asian food. Stretch a few more blocks and the count jumps to include even a takeout shop that specializes in bite-sized duck necks. Old guards like sushi-joint Kyoto, at Canterra, remain in New Chinatown. But what’s new are fast-casual and dessert places, some unique to Edmonton. 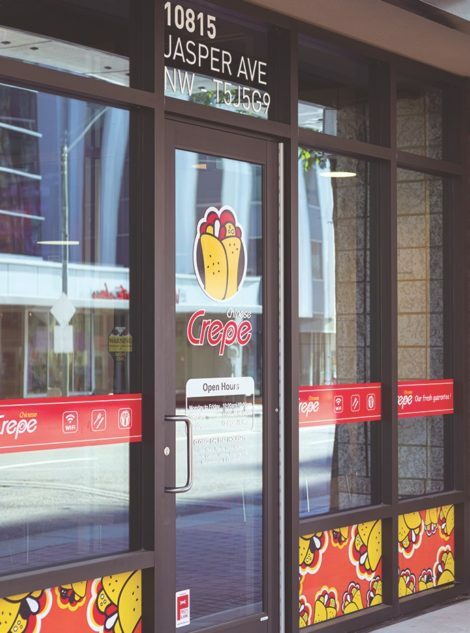 Chinese Crepe sells jianbing, or Chinese crepes—and it’s the only jianbing shop in Alberta. Tsujiri, a Japanese chain for all things matcha, opened its first Canadian location outside of Toronto across from Save-On-Foods. In Any-City-Asia, snacking is social. Snack places aren’t so much spots to share dishes but stories. And this is what’s so interesting about New Chinatown. Traditional Chinatowns in North America often cater to non- Asians, but New Chinatown doesn’t. Instead, it unapologetically brings Asian snacking culture to Edmonton. The shops are smaller, the colours are pastels, the fonts playful. The menus offer English but require experience. The staff will explain what, say, tapioca pearls are, but expect some serious side-eye if you ask. Another factor is the North America-wide trend for urban Chinatowns to be overtaken by car-centric, suburban Chinatowns. Asian snacking culture is alive and well in Richmond, a suburb of Vancouver; Markham, a suburb of Toronto; and in the 626 area-code of suburban Los Angeles. But unlike the ethnic ghettos created by racist policies from the past, these areas are statements of affluence. In Edmonton, there are a few pockets— roughly wherever there’s a T&T—but none has the concentration to be Edmonton’s Richmond. She’s right. From Korean bingsoo (shaved ice dessert) to Thai gai-yang (grilled chicken), New Chinatown is pan-Asian. Indeed, it’s not unlike the mix of food you’d find on offer in Any- City-Asia. Maybe I should call it “Asian Corner” instead? Jackie Lee lives, works and eats downtown. He is originally from Hong Kong and has snacked his way throughout Asia.